Scott Lane Paskett passed away peacefully on March 21st, 2018 in Hillsboro Oregon. He is survived by his sons Dean Scott, Bruce Lane, Brad Thomas, Brad, and daughter, RaeLynn Weidner. In addition to 15 Grand and 16 Great Grandchildren, all of whom he loved and cherished. 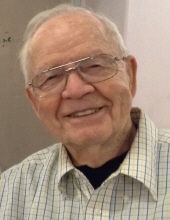 Born August 17, 1927 in Henefer, Utah to Howard Paskett and Marguerite Reiser Paskett, Scott remained in his hometown until serving in the Second World War as a Naval electronic technician. After the war, he partnered with his family in a sheep ranch business, graduated from the University of Utah with a BS Degree in Mechanical Engineering, and had a successful 35-year career with Worthington Pump and Machinery/Dresser Industries as a District Office Sales Manager. Throughout his life, Scott prized his membership in the Church of Jesus Christ of Latter Day Saints (LDS). Scott loved and appreciated the many friends he accumulated over the years; most recently at his retirement homes in Hillsboro. His life was further brightened by the relationships created with the numerous Missionaries who did service projects at his retirement home. Funeral services will be held at 12 noon on April 5th at the Rock Creek Ward of the LDS church located at 19180 NW West Union Rd. in Hillsboro, Oregon. Scott will be put to rest with full Military Honors at Willamette Nation Cemetery in Portland. The family asks that in lieu of flowers, donations be made to the American Heart Association in his name. To send flowers or a remembrance gift to the family of Scott Lane Paskett, please visit our Tribute Store. "Email Address" would like to share the life celebration of Scott Lane Paskett. Click on the "link" to go to share a favorite memory or leave a condolence message for the family.